Lucy wants to join the Fairy Tail, a club for the most powerful wizards, but her ambitions land her in the clutches of a gang of dangerous pirates and devious magicians. Her only hope for rescue is Natsu, a strange boy she met on her travels, but does he have what it takes to be a hero? 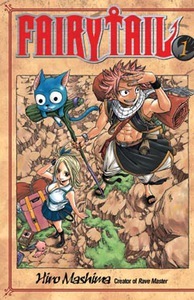 Story and art by Hiro Mashima.